When the paper markets finally collapse, the silver market is set up for much higher price gains than gold. Why? Because the fundamentals show that precious metals investment demand has put a great deal more pressure on the silver supply than gold… and by a long shot. There are three crucial reasons why the silver price will outperform the gold price when the highly inflated paper markets disintegrate under the weight of massive debt and derivatives. While many precious metals investors are frustrated by the ability of the Fed and Central Banks to continue to prop up the markets, the longer they postpone the day of reckoning, the worse the collapse. 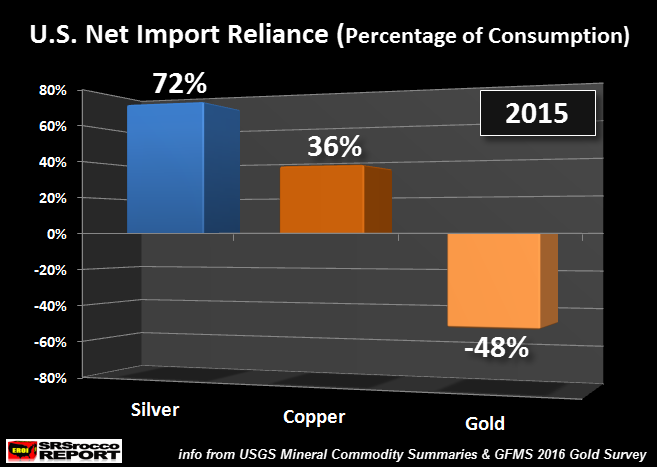 The United States silver net import reliance as a percentage of total consumption, was 72%, versus 36% for copper and a negative 48% for gold. This chart shows that the U.S. relied upon 72% of its domestic silver demand from foreign sources in 2015. Thus, U.S. silver supply reliance (72%) is double that of copper (36%), while U.S. gold demand enjoyed a 48% surplus versus its domestic supply. 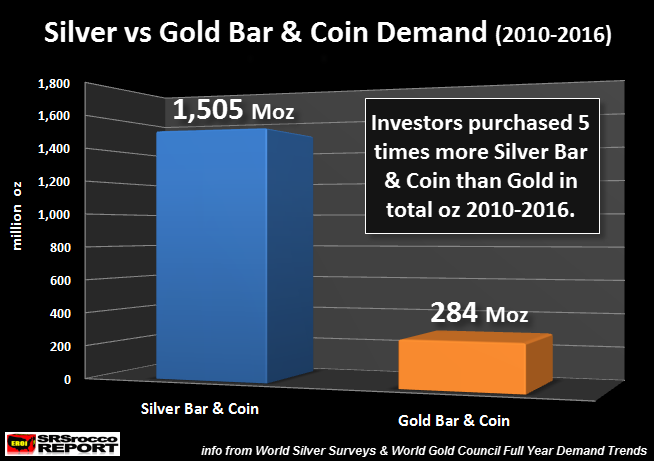 From 2010 to 2016, investors purchased a total of 1,505 million oz (Moz) of silver bar and coin compared to only 284 Moz of physical gold. Thus, precious metals investors purchased five times more silver ounces, than gold ounces during this seven year time period. Of course, the total value of physical gold investment was much higher than silver during this time period, but this tremendous amount of silver bar and coin demand has impacted the silver market much greater than the gold market. While it is true that World Gold Council may be underestimating Chinese physical gold demand, and its impact on the annual surplus of deficit figures, a 7.5 Moz surplus is only 3% of the 284 Moz total gold bar and coin demand figure 2010-2016. 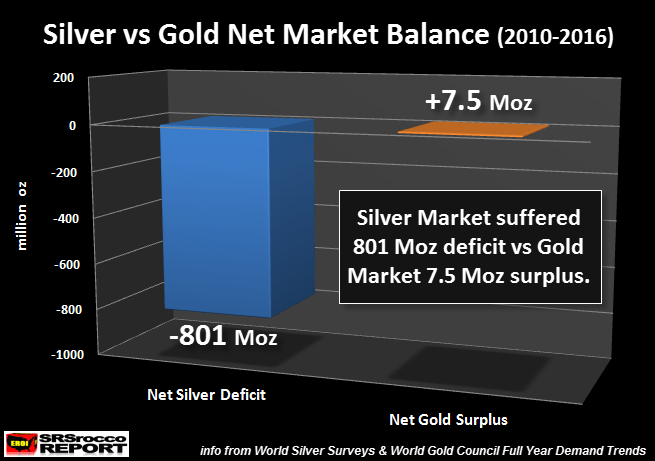 However, the 801 Moz net silver deficit is more than 50% of total silver bar and coin demand during that same time period. Which means, physical silver investment demand is causing much more stress on the silver market than it is on gold. While the silver market has been able to supplement the annual deficits with old silver coin stocks or large bars that were liquidated during the 1990’s, this is not an endless supply. According to the data I obtained from the GFMS Team at Thompson Reuters, invested dumped a net 580 Moz of silver bar and coin on the market between 1995-1999. Now compare that to the past five years (2012-2016) as investors purchased a net 1,152 Moz (1.15 billion oz) of silver bar and coin. And here is the CLINCHER. From 1985 to 2007, the total net silver bar and coin demand was a NEGATIVE 95 Moz. Which means investors sold a net 95 Moz of silver bar and coin in that 23 year period. However, investors purchased a net 1,785 Moz of silver bar and coin from 2008 to 2016. This is a huge TREND CHANGE. After the U.S. financial and economic meltdown in 2007, investors continue to purchase a record amount of silver bar and coin. This has put severe stress on the silver market as the total net deficit since 2008 surpassed 1,155 Moz. While the silver market will continue to supplement the ongoing annual deficits with old silver stocks, this supply is not endless. Furthermore, the days of the TRUMP STOCK MARKET RALLY are numbered. The last time the stock market crashed 2,000 points in the beginning of 2016, investors flocked into gold and silver in a BIG WAY. In conclusion, the fundamentals in the silver market are setting up for a much higher price spike than gold due to the three reasons stated in the article. The timing of these event is hard to forecast as it is difficult to pinpoint when the Fed and Central Banks lose control of their massive market intervention. My work is not meant to provide a short term outlook on the precious metals, rather it offers fundamentals that will win out over the medium to longer term. Precious metals investors need to look at buying and holding gold and silver the same way an individual puts money away each month in their 401K, pension plan or retirement account. The difference between the precious metals investor acquiring PHYSICAL METAL compared to individual acquiring PAPER ASSETS or DIGITS, is one is real wealth, while the other is an IOU. Those who transition out of PAPER-DIGIT IOU’s and into physical gold and silver before the FAT LADY SINGS, will be rewarded with much better options.